If you’ve been following my journey to run at least a half marathon in all fifty states, you will have noticed that I’ve already done Florida. 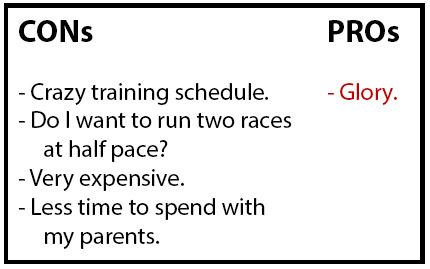 In fact, I’ve run four races there already, so why spend more time and money on a state that gets me no closer to my goal? 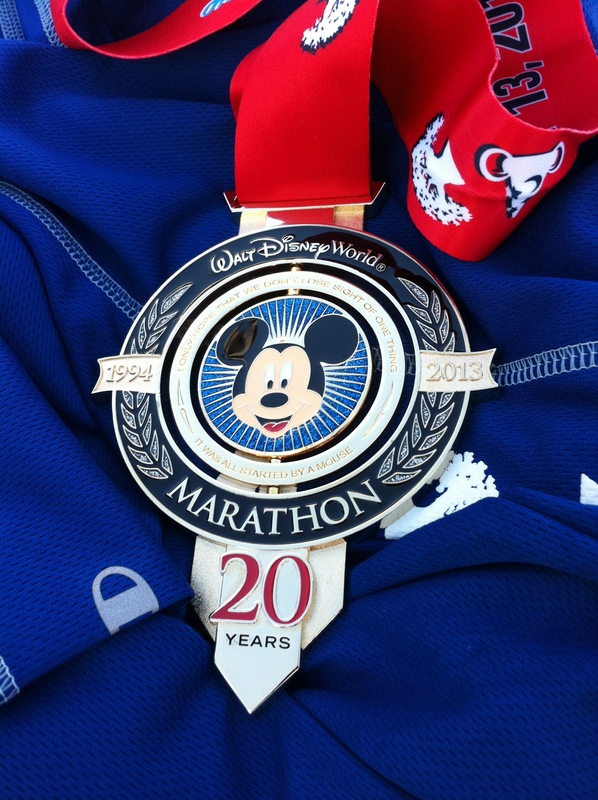 Because the Walt Disney World Marathon has been on my bucket list since even before I became a runner. I knew about Chicago, New York and a few others, but the day I realized there was a race that took you through the Disney theme parks, I thought, that sounds insanely hard why would anyone do that so fun. This was before I had even finished my first 5K. See, though I may be 30, I never became immune to the veil of wonder that theme parks drape over their guests as they cross the turnstile. I’ve been visiting Disney parks since I was an infant and can’t imagine one day entering one of their parks with a cynical scowl. In fact, whenever I see kids crying at Disney, I want to ask them, how awful is your life that you’re sad in here? Or maybe it’s the opposite – they live the best lives imaginable, eating brownie skillets for breakfast and lobster mac ‘n cheese for dinner, that anything else is a daily waterboarding. Or perhaps the parents are the culprits. You got your kid to cry in here? In the words of Chris Farley, what did you DO?! Because Disney World really is the happiest place on earth. Sure, you have to wait for hours in line and there are many more cost-effective and altruistic ways to spend the cost of admission, but once you’re inside Brer Rabbit’s Laughing Place or feeling your stomach drop just waiting for the Tower of Terror’s initial lurch, the world is different. Disney goes a long way towards making you feel like you’re somewhere else and that talent is made manifest from the minute you step in line. But it’s not just within the confines of the resort that the Mouse tries to achieve the company goal of making people happy. 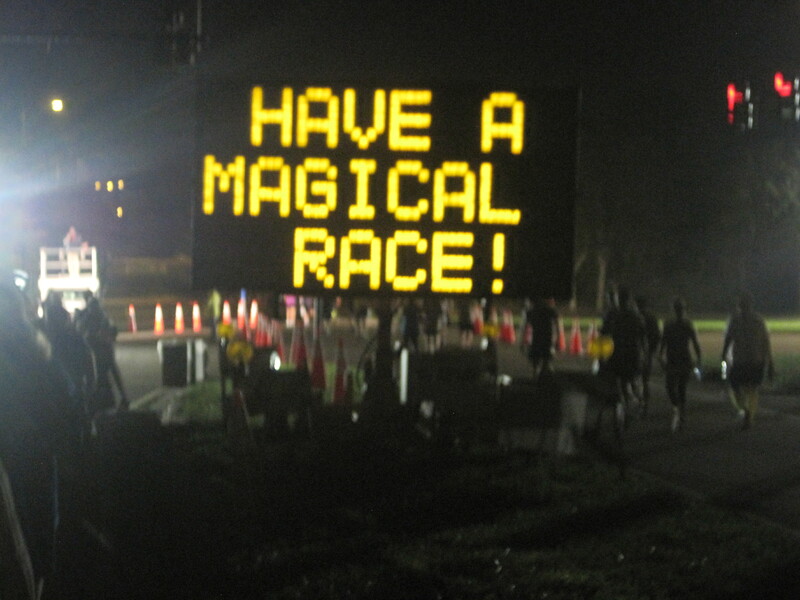 Having run both the 2010 Disneyland Half Marathon and the 2011 Wine & Dine Half Marathon, I had learned that this magical feeling goes beyond the park experience. There was no good reason to sign up for Goofy except, of course, the challenge and eternal glory that comes from finishing it. But given the confluence, I decided that I would enjoy running at full speed for one race than holding back during two. Much to the dismay of my Chicago friend Marissa (who did pull the 39.3-mile trigger), I committed to “just” the marathon. My date with destiny (Disteney?) was on the horizon and my hopes were high for an excellent season. What could possibly go wrong? As always happens when anyone writes that last question, stuff goes wrong. Rather than run the conventional 20-miler four weeks before the race, I was in Boulder City running the Hoover Dam Marathon. It went very well and my legs were surprisingly fresh afterward. But three days later, I would go for a run to learn that my left arch was not cooperating with me. A week later, after no running whatsoever, it hurt just to stand. I was very worried about this because I had never suffered such a persistent injury and certainly not one that wasn’t responding to rest. Fortunately, around New Year’s, I went on a successful 7-mile run with Otter and our friend Marla and my worries were put to rest. I wasn’t back 100%, but the progress was very encouraging. But I couldn’t quite get back into a regular training groove. 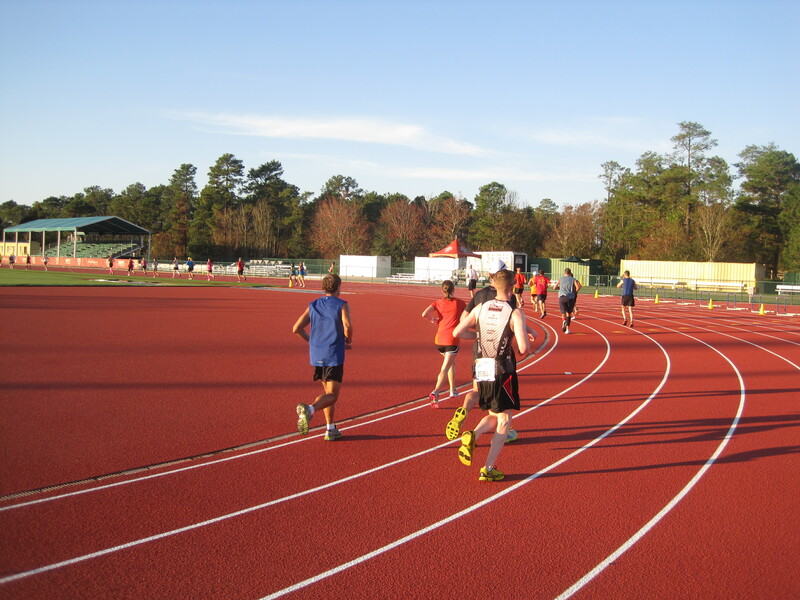 Even with perfectly sound feet, the constant barrage of holidays eats into my training time. Obviously this isn’t a complaint, it’s just a reality. Like someone building a sand castle too close to the water, the three-punch series of Christmas, New Year’s and a trip with my extended family to Park City made carving out running time a challenge by itself. I ended up covering just under half of my usual training distance prior to Disney because of this (and my longest run was the aforementioned 7-miler), so my confidence was a bit shaken. Additionally, two out of three family members were incubating some nasty colds, to which I was sadly not immune. And just to add a little glitter to this cake of apprehension, this was to be my 13th marathon, held on the 13th day of 2013. If superstition is your thing, then you too would have been a little concerned. Disney was built on a swamp, so I was anticipating heat and humidity. 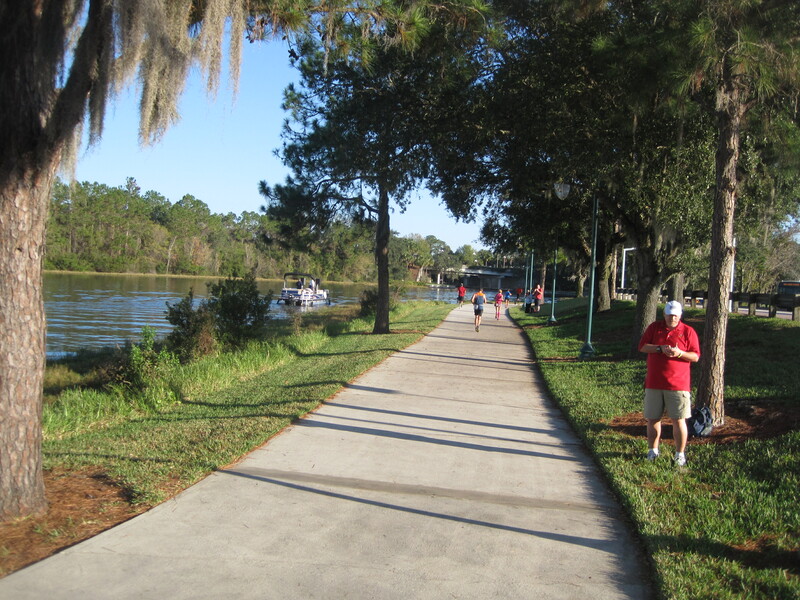 Given the forecast for Kissimmee, Florida, I was expecting a finishing time just under four hours. When you add up all of these elements, I was basically resigned to running what I would consider a slow time. In light of this I decided: screw this, I’m going to try and have fun. For the first time ever, I would run to enjoy the race, take in the sights and even take a picture or two fifty. I would still bring my Garmin and keep a decent pace, but I wouldn’t delude myself into thinking I could somehow post a competitive time. So it was with this mix of reassurance and caution that I entered Corral A on race morning. It was about 4:45 AM and I had already done a considerable amount of walking. 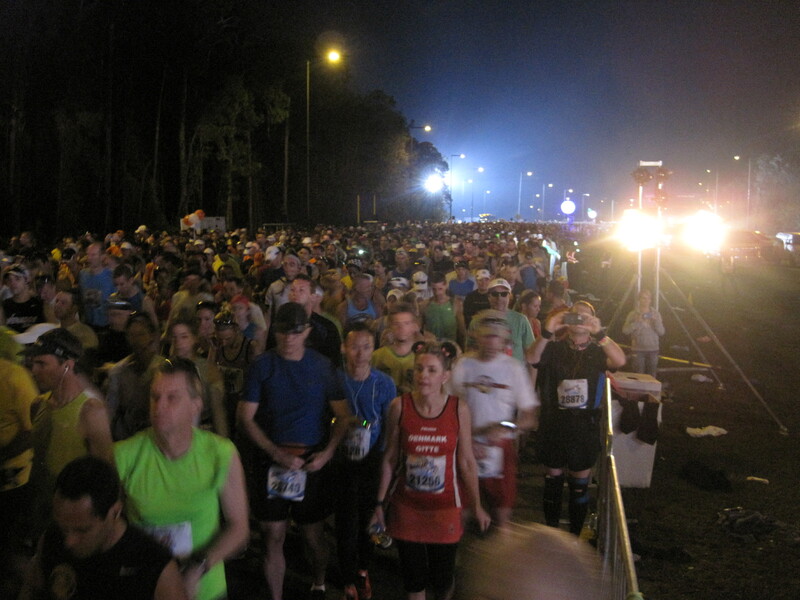 It was about a half mile from the runner drop off to the staging area at the Epcot parking lot and then another three fourths of a mile (easily) from there to the start line. I sat down on the pavement and waited for everyone else to make their way, while a DJ tried his damndest to energize the crowd. That’s one thing about Corral A: these people are out to dominate the course and are conserving every last drop of glycogen, which means they won’t do any choreographed dance moves, no matter how enthusiastic the MC is. It was enough of a challenge to elicit a cheerful “yay” from anyone. It was like watching a clown try to cheer up war torn refugees or that much-loathed boss try and rev up the employees that wish him dead. Though I wanted to support him, he certainly didn’t earn any points from me by playing the Cha Cha Slide and the Macarena back to back. It wasn’t long before the official announcers took the stage just a stone’s throw away from me. 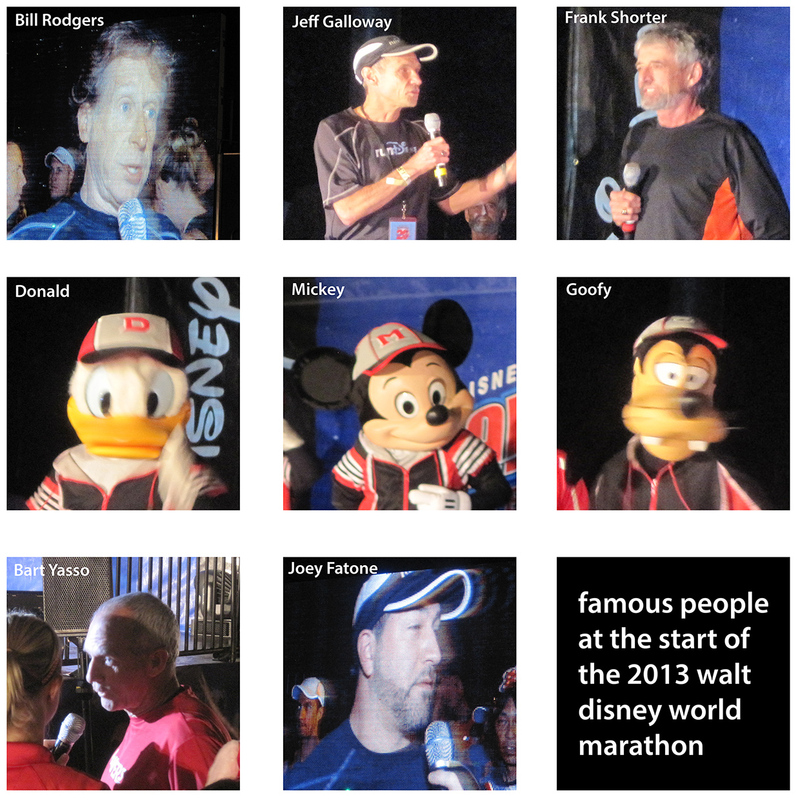 I was very impressed with the lineup of running celebrities that Disney had put together for the last-minute pep talk. Among them were Bill Rodgers (Boston and NYC Marathon winner in the 70s, credited as part of what started the running boom), Jeff Galloway (Disney’s official running coach, author of very popular marathon training programs), Frank Shorter (Gold medalist at the 1972 Summer Olympics marathon), Bart Yasso (Runner’s World’s Chief Running Officer and mastermind of the Yasso 800s) and even Joey Fatone (dude from ‘NSYNC who I didn’t recognize until they said his name). After all the famous people had given their words of encouragement, the true celebrities were welcomed to the stage. Mickey, Donald and Goofy bumbled upwards in black and red track suits, speaking with giant smiles and wild gestures, giving everyone the green light. A few minutes later, I crossed the start line under fireworks with four parks and 26.2 miles ahead of me. The road to the first park of the race, the Magic Kingdom, felt like forever. We were running on the three-lane road that services the Epcot parking lot and it was lit only by streetlights. There wouldn’t be any buildings until the 5k mark (which I reached in 26:45) and even then it was just the parking lot for the monorail. I had heard this complaint from friends who have run this race before: that it’s mostly running on highways with theme parks in between. Given that most races are run on boring roads, I wasn’t going to complain at all. But those first miles did stretch on longer than I thought they would. I also noticed at this point that I was already drenched in sweat, despite running a slower pace. This didn’t bode well. But what could I do? Slow down? Pass. I decided instead to just focus on other things and let the auto-pilot take over. However, my zen was broken by a sinister staccato, a dark melody that I was too slow to recognize until I saw Jack Skellington and Sally by the roadside. That’s the other thing about Corral A. The majority of us are so hell-bent on getting the fastest time possible that we won’t stop for anything except the essentials. In other words, there was no one in line to get a picture, so I zipped out and gave the Pumpkin King my scariest pose before returning to the course. By mile 5 we finally reached the outside of the Magic Kingdom and entered through a service entrance right onto Main Street USA, where every building had been wrapped in lightbulbs. 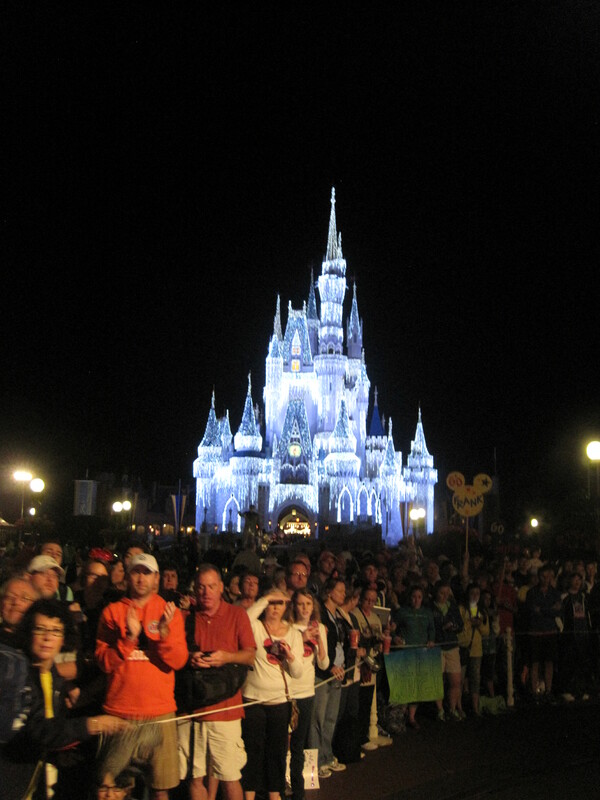 Not to be upstaged, Cinderella’s castle had also been draped in a web of light, looking almost ghostly in the distance. I ran through this section with an enormous smile, which widened as I drew closer to the castle and the spectators grew louder. However, instead of running straight to the fairy tale structure, we banked right and took a detour through Tomorrowland. Back in the Disneyland race, Darth Vader had set up camp around here with a detail of several Storm Troopers. I was a little disappointed to discover he didn’t show up to this race. It was more likely that he had gotten zapped to another dimension by Buzz Lightyear. 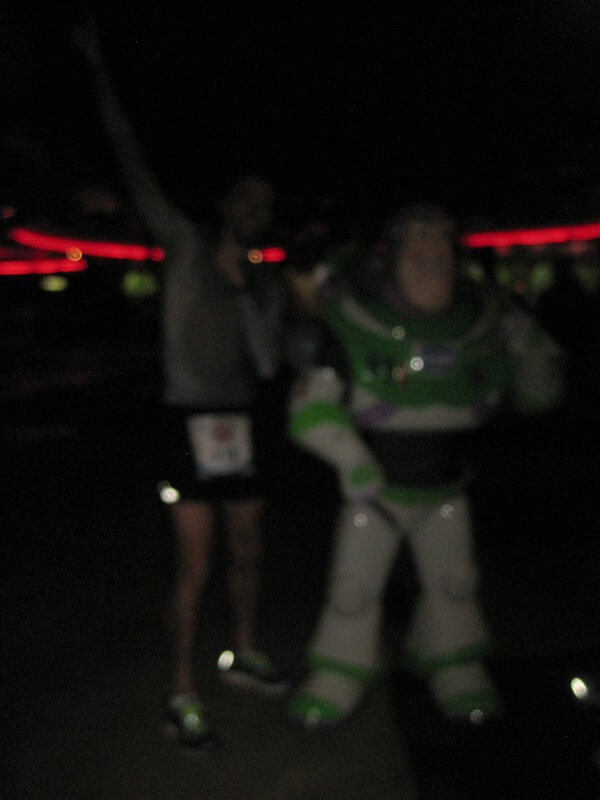 I’m not sure why I decided that the Usain Bolt was the best pose for this galactic ranger, but that’s what happened (not that it matters, the picture was so blurry that you can barely tell which one of us is the guy with delusions of grandeur and which is Buzz Lightyear). After running underneath Cinderella’s castle, we ran right into Frontierland, where I caught a glimpse of Splash Mountain before leaving the park. Once back on the park service roads, I passed the 10k flag in 53:15, keeping my pace steady. I hadn’t exactly stopped sweating and I was blowing snot rockets every thirty steps, but I felt “good” so onwards I went. 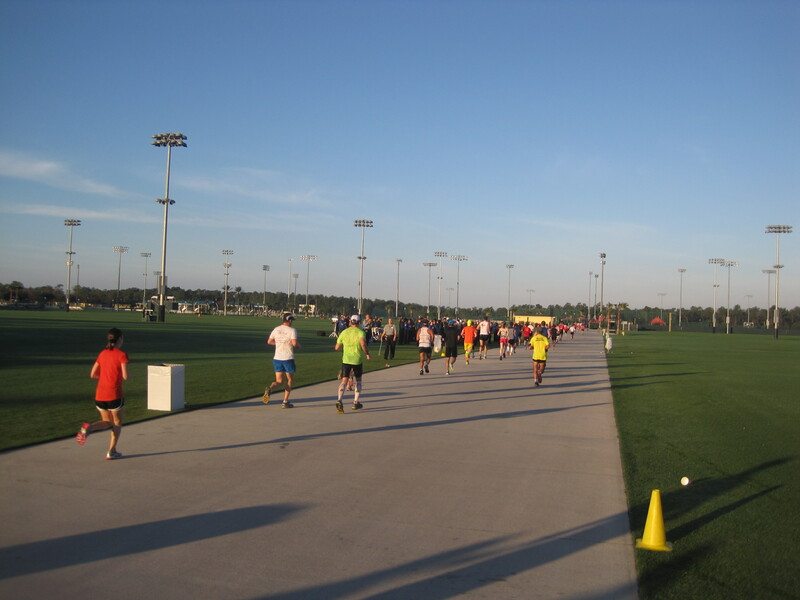 The next stop was a loop around the Walt Disney World Speedway, which organizers had added as a bonus for the 20th anniversary run. Right before entering though, I spotted everyone’s favorite blue commander of phenomenal cosmic power, so I split from the path for a second to rub his lamp get a picture. Once inside, it was like being at the 500 Festival miniMarathon again, except the sun had yet to crest the treetops (and we were running the loop clockwise). Just outside the speedway, I crossed the 15k mark in 1:18:58, noting a slight increase in speed. 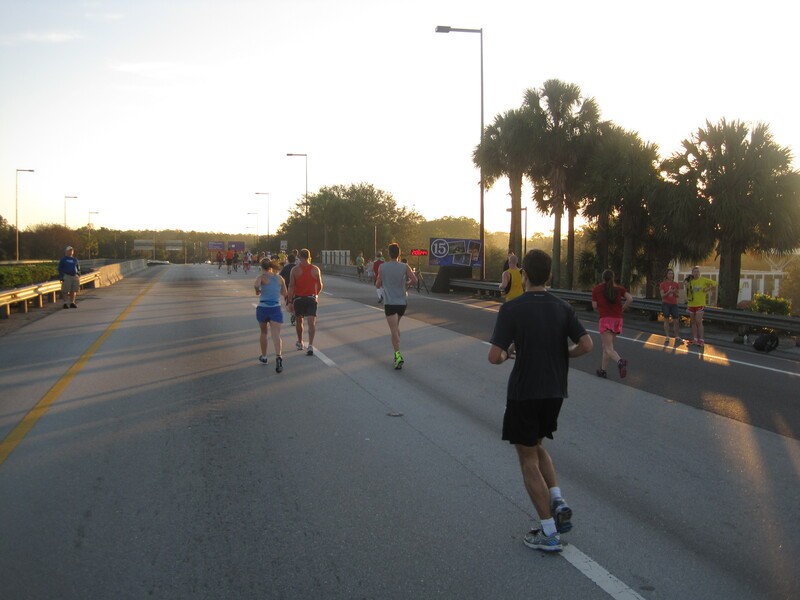 The next two miles would be run on a two-lane service toad that cuts through the Floridian bog. On the way, I heard “Bad to the Bone” being played off course, a sure sign of a rendezvous with villainy. I leapt onto the damp grass and got a picture with a group of four baddies, which included Gaston, Maleficent, Snow White’s Evil Queen and Dr. Facilier (the voodoo guy from The Princess and the Frog). After a few more turns, we reached the Disney Waste Water Treatment Plant. Lucky for us, we didn’t run through it and were thus spared any potential weird smells. That honor was reserved exclusively for Animal Kingdom. The smells were honestly the only real memory I have of Animal Kingdom. The occasional waft of wild animal would sneak into my nostrils and then leave, as if notified by Disney officials that such treatment of tourists was out of line. 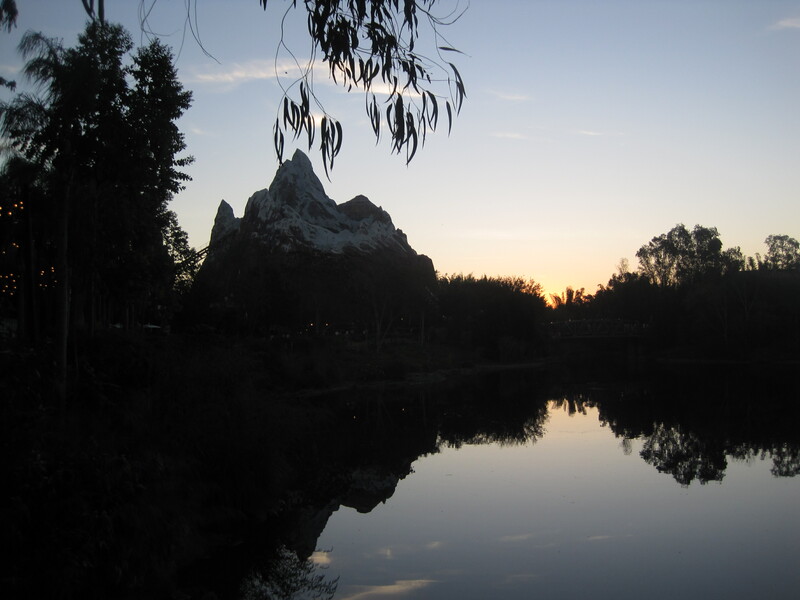 At one point I stopped to get a picture of the Everest Expedition ride, and I remember seeing a giant orange dinosaur towards the end. But just as soon as we entered, we were out, with the 20k mark hidden somewhere inside the park (crossed in 1:45:02). 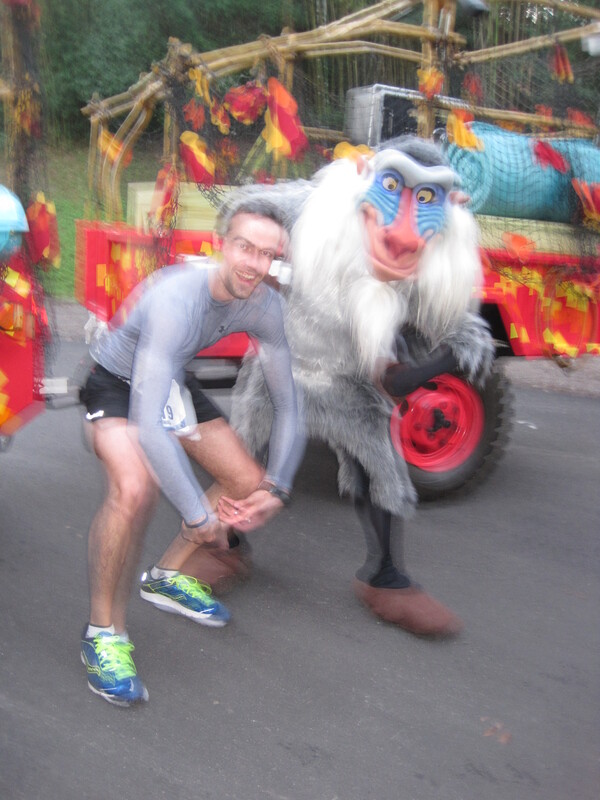 I also got blurry pictures with Rafiki and the notorious Captain James Hook. I didn’t feel as bad as I look in this picture. 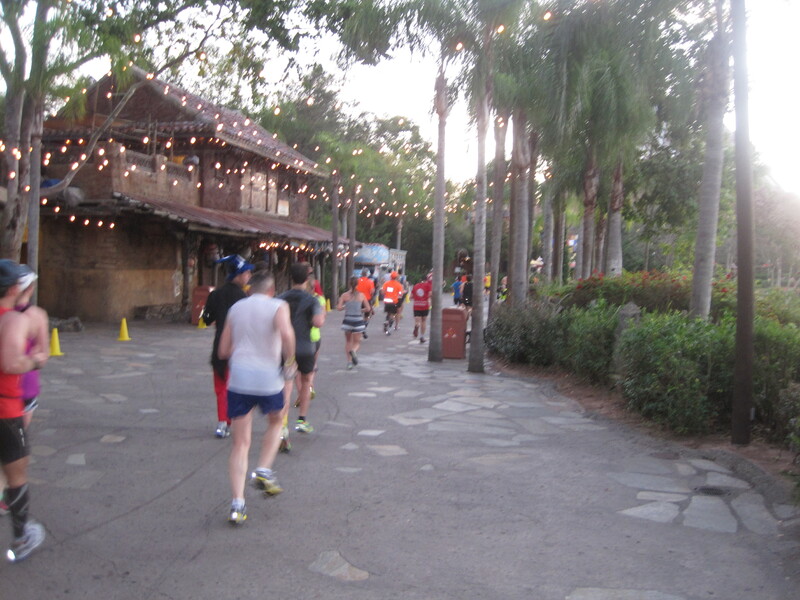 The sun first hit my face around mile 14 as we ran through the Animal Kingdom parking lot. I remember trying to keep the pessimism from taking over my otherwise effortless run. Up until this point, the temperature had remained in the mid to low 60s and I had gotten this far without any complaint. But now the sun was out and anything was possible. I had been wearing my sunglasses on my head for the entire run, but when I put them down over my eyes, the combination of sweat and steam had rendered them almost completely opaque. So I put them back on my marshy hair, spotted Pluto on the side of the course, got a picture with him, and continued running. Despite the sun rising over Orlando, I was somehow speeding up. I’m not sure what gland secreted stupid juice into my system for this. What elusive lesson did I learn in the last three years that taught me to speed up when the sun comes out? Did the roller coasters at Busch Gardens jostle some ossified wisdom out of a deep crevice in my brain? Or did had they instead shaken it out of proper alignment? 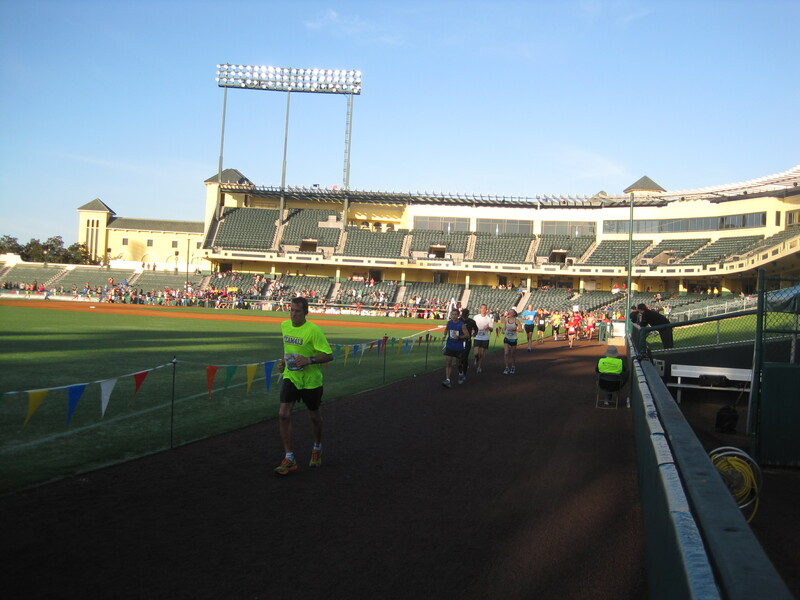 Regardless, by the time we reached the ESPN Wide World of Sports (another bonus addition for the 20th anniversary), I was running in the high 7s, comfortably passing many runners. There was a considerable amount of highway running between Animal Kingdom and ESPN, during which I crossed the 25k mark in 2:10:14. Of all the venues in the race, this was the one that took up the most distance. It wrapped in and out of baseball diamonds, around a track, across fields and back onto the highway for the 20-mile celebration. 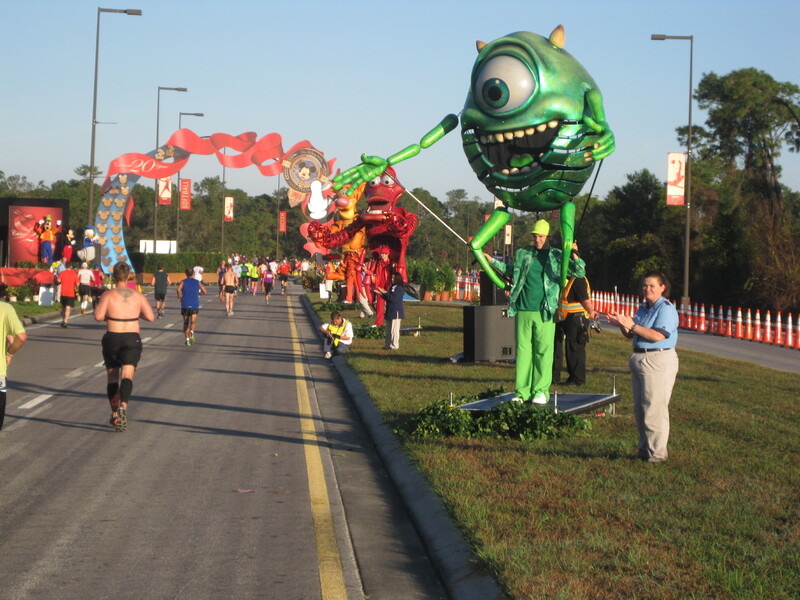 Organizers had lined up huge, dazzling marionettes of Mike Wazowski, Lumière, Sebastian, Genie and Tigger on the side of the road. There was also a large banner with pictures of every single Disney Marathon medal ever given out, including this year’s. If you know my rules for racing, you’ll know that I kept my head down. But I quickly picked it back up. I was feeling strangely well. Every step was a wet, sloppy mess, but for some reason I wasn’t dying yet. I remembered those two warm Chicago marathons where I had essentially given up by mile 20, wondering how I was avoiding that resignation. Maybe it was the Buca di Beppo I had stored in my stomach the previous day for lunch or the barrel-sized Gatorade I downed over the course of the same day. But I still had the last, worst 10k left, and anything was still possible. So I decided to just go hard until I hit that disastrous wall. There was no way I’d be able to maintain this pace along with my sweat rate for much longer. One of them had to slow down, and I hadn’t yet learned how to stop sweating. But taking it easy was no longer an option. 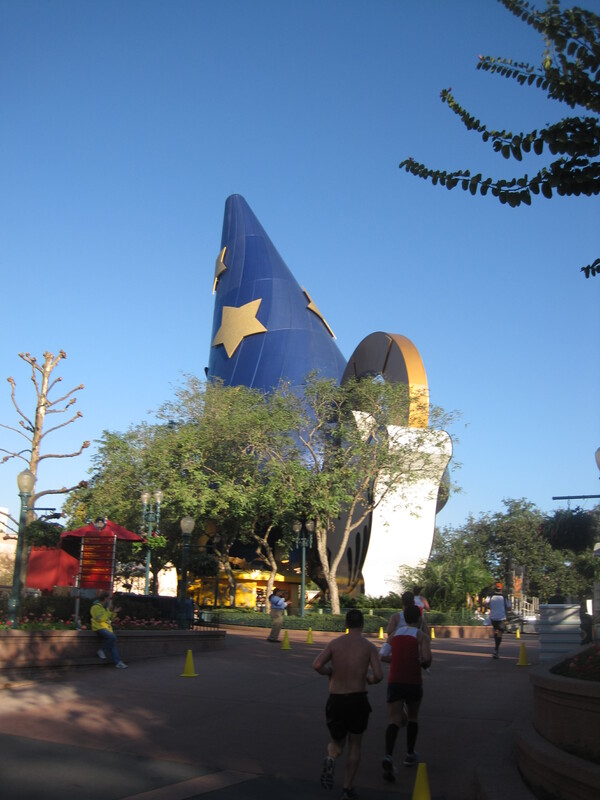 So on I went toward Disney’s Hollywood Studios. One of the best rides ever, period. I ran towards the Hollywood Tower Hotel like a moth drawn to a haunted terra-cotta flame. 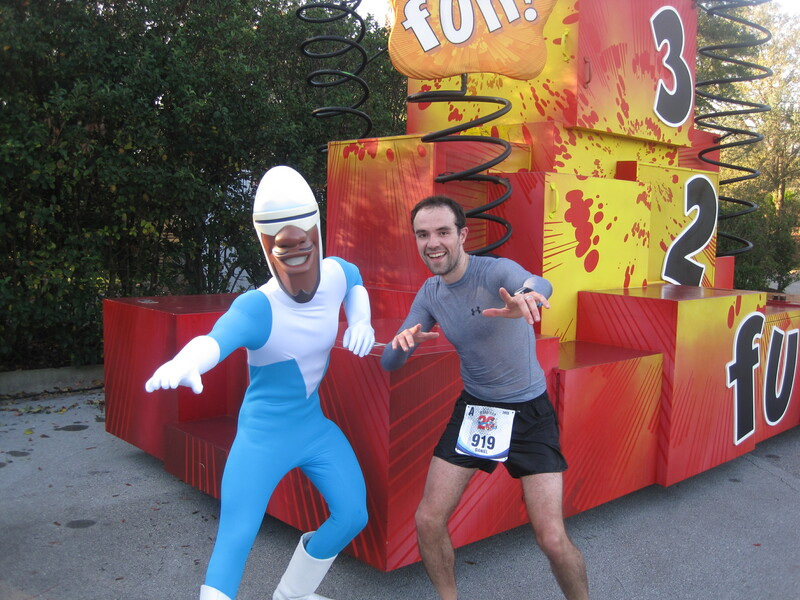 I dashed inside the park, stopping only to pose like a superhero with Frozone (where is my super suit?! ), scare kids with Sully and inflict structural damage with Wreck-It Ralph. 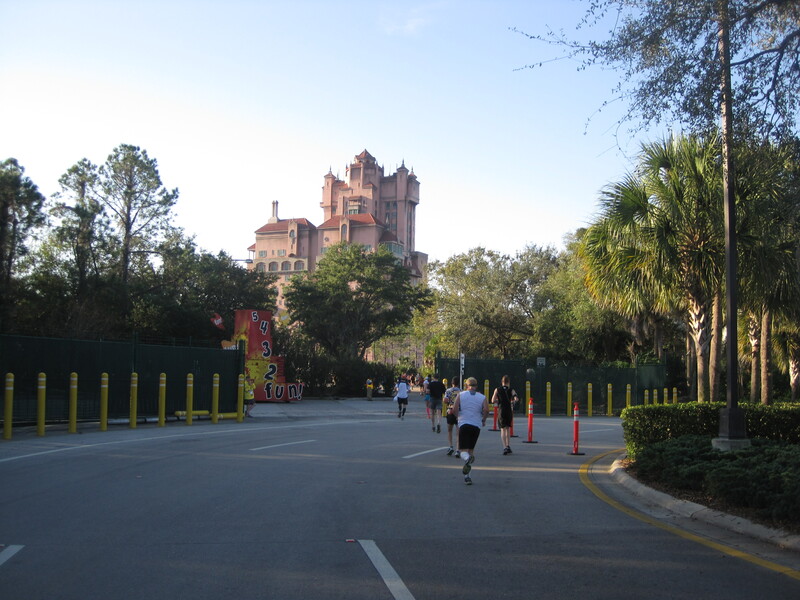 We ran through the fake New York City and past the Sorcerer’s Apprentice hat, out through the front gates and towards Epcot. Another park, another blur. Except by now I was definitely starting to fade. It wasn’t a sudden weight on my shoulders, but a slow reduction, as if someone had opened a spigot and I couldn’t find a way to close it. Just two more miles, I thought. I can run two miles in my sleep. 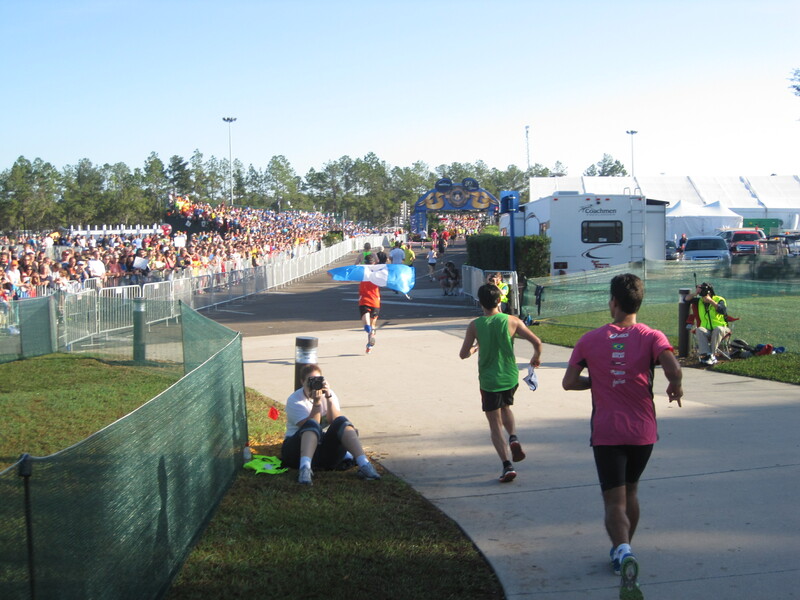 Once out of the park, the course continued alongside a pond shared by several Disney hotels. Just before the 40k mark, we were running through the Disney Beach Club Resort, cruising past pool decks and cabanas. The last mile was a spin around the Epcot Lagoon, the iconic Spaceship Earth (more commonly known as the Epcot Golf Ball) in my periphery. I was definitely tired, but not at all dead. My pace was right in the mid 8s, slower than the last 5k, but still strong. My breathing was heavy but controlled, and I was negotiating between stopping to take pictures and attacking that final mile. My current pace was going to put me very close to my Little Rock time … a little too close to it. Sometime in the last 6 miles I had shifted from my original carefree attitude to the familiar grunt of a hard effort. Towards the last few showcases, I was passed by a couple that I recognized. I had surged past them at ESPN, and here they were, making up the distance, almost frolicking past me like they didn’t have 25 miles behind them. That did it. I swung an invisible lasso around them and picked up my speed. 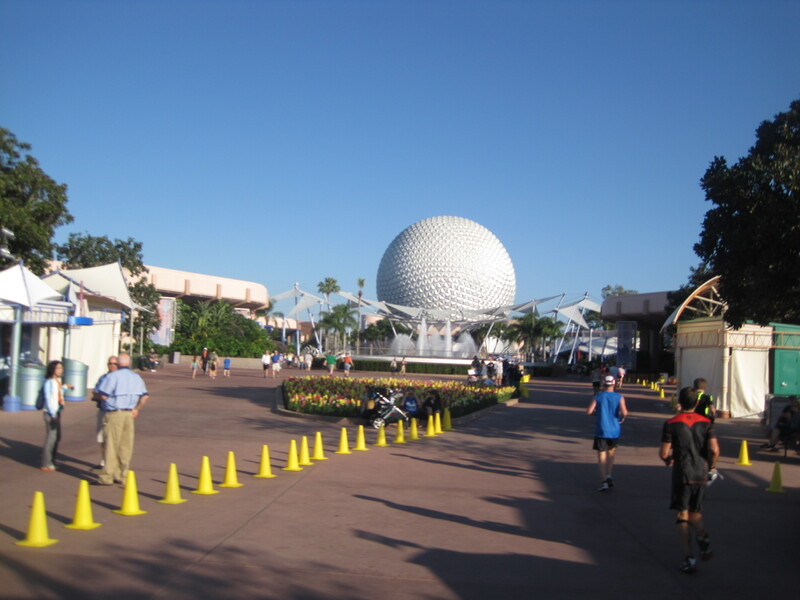 On we went, past Spaceship Earth and into the parking lot, where the blue finishing banner awaited. I didn’t sprint the end, nor did I take any pictures of it. I simply kept going, one foot in front of the other, completely unaware that I hadn’t gotten a single pain or cramp in the last 3 hours, 38 minutes and 40 seconds. I was simply in the moment, living out an awesome experience put together by one of the most imaginative companies on earth. Say what you will about Disney, but they know how to put an event together. I had just completed the most fun marathon of my life, beat my Little Rock time and fist-bumped Bart Yasso (and Bart, if you’re reading this, I can be your successor). But the best part of the event was yet to come. As I walked into the gear check tent, about twenty volunteers began clapping just for me. It’s in these details, the differences that truly make the event stand out and every runner feel special, that Disney excels. I can only hope that these tireless volunteers managed to keep up the enthusiasm for every other runner that would later pass through that tent. With the 20th anniversary medal proudly resting on my chest and my 4th fastest marathon in the books, I went to look for my parents. I had a few hours to kill before my flight, so we went to Marlow’s Pub to chow on animal flesh. I ordered the Kitchen Sink burger and a few Magic Hats, which I cheerfully drank. After all, I was pretty happy. I had somehow kept up a solid pace for the entire race, despite sweating enough to soak my shoes. Maybe it was a sign that I’ve improved a little. Or maybe stopping to take pictures of Disney characters kept me from going too fast and bonking hard. Or perhaps I second-hand smoked some of that magical pixie dust radiating off the characters’ clothing with every pit stop, a constant whiff of powdered magic that jolted me the rest of the way. The most likely explanation is that a 5:30 AM start mitigates adverse weather effects … and it didn’t really get that hot. Regardless, 2013 is off to a great start. 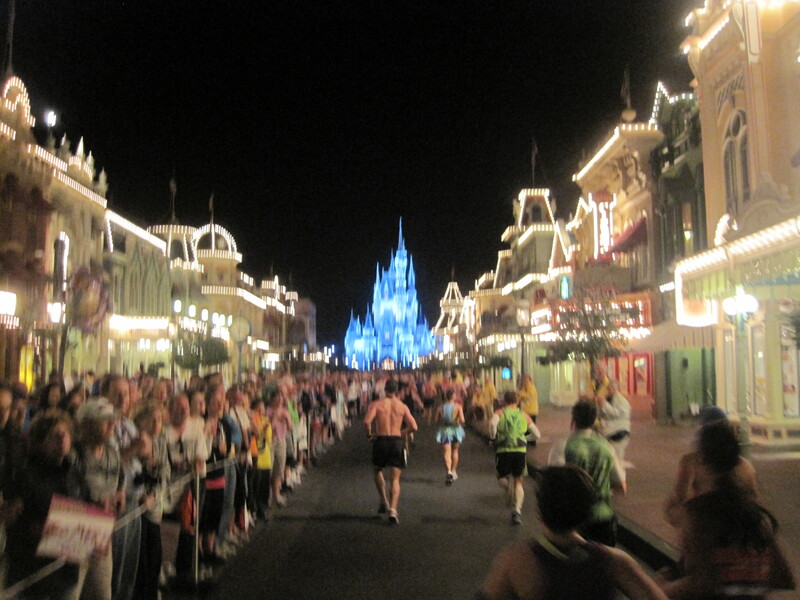 Anyone who loves to run should at some point in their lives complete the Disney Marathon, especially if you’re the kind of person who likes to “have fun” during these crazy events. It’s not the cheapest race, but you can definitely see where the money goes because every single part of it has that Disney touch that makes you remember what it was like to be five years old. And lastly, since I’ve run both a half marathon and now a full marathon in Florida, I can finally shade another state in red! Onwards! Awesome! You’ve sold me on doing this next year for my 30th Bday. 🙂 Only didn’t this year because of an injury setback. 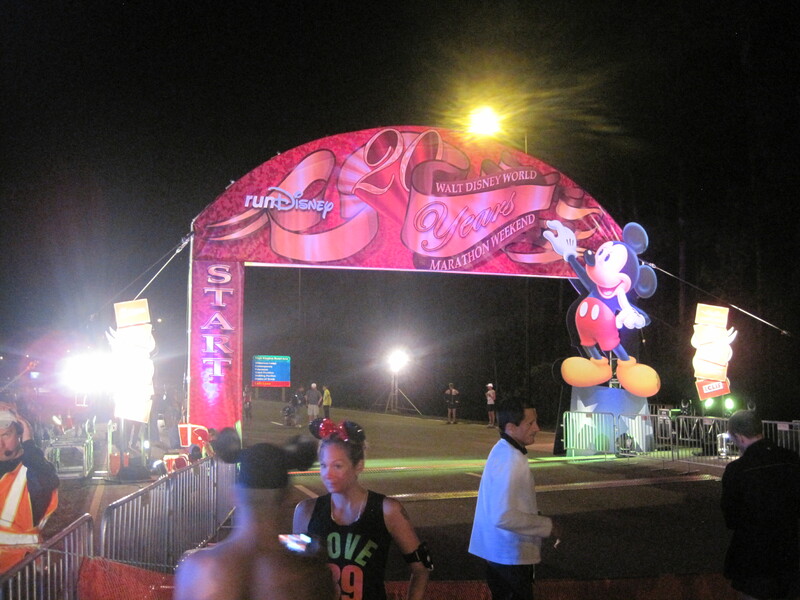 Disney really does do an awesome job with their running events. They’re super expensive, but worth it, I think. I just had a similar experience in a half. I had entered one to pace a friend and they backed out, and I was behind in training, so I just decided to go, run at least 10 miles of it at an easy pace, rest when I needed, stop at all the aid stations for a drink and just enjoy. Wound up tracking my second fastest time and feeling great afterwards. Go fig. Great work, Dan!! Keep it up!! Funny how when you think you’re not up to something, your body seems to disagree with you. Sadly the opposite also happens, but it’s nice to know we managed to secure the positive outcome. Thanks for reading! Great review. I’ve heard so many amazing things about this race. Thanks for the photos! 1. Awesome time for just ‘taking it easy. I’m pretty sure it’s part of just improving. 2. You sound like a total goof – clearly there is some kind of Disney crack that they sprinkle around the park. 3. The term ‘snot rockets’ totally grosses me out. Do you prefer the term “Farmer’s Hanky”? Don’t even lie – you made that expressions up right now, didn’t you? I had to think too hard about it, then I visualized it, and I am now equally disgusted. Awesome! I think i’m going to run the disney princess half next year, for sure. no exceptions. I might even do a twofer while I’m out there! But nice recap, love the pictures! your map is filling in nicely! If by “twofer” you mean the Goofy Challenge, then maybe 2015 would be a better year as it’ll be their 10th anniversary. Not sure why I like these milestone years but I do. Thanks for reading! Let’s hear it for the Mouse! I sense a more – dare I say reverential? – tone than your usual race report. Gotta admit that despite my own love of Disney, I had very little interest in running the Florida race before today. But you’ve sold me. Great pictures, you definitely have that “big kid” glow on your face. Me, I’m still hoping to be Jack Skellington when I grow up, though of course I have a natural soft spot for Mike Wazowski. You hit it on the head… the devil is in the details, and Disney really is more devilish than anyone. 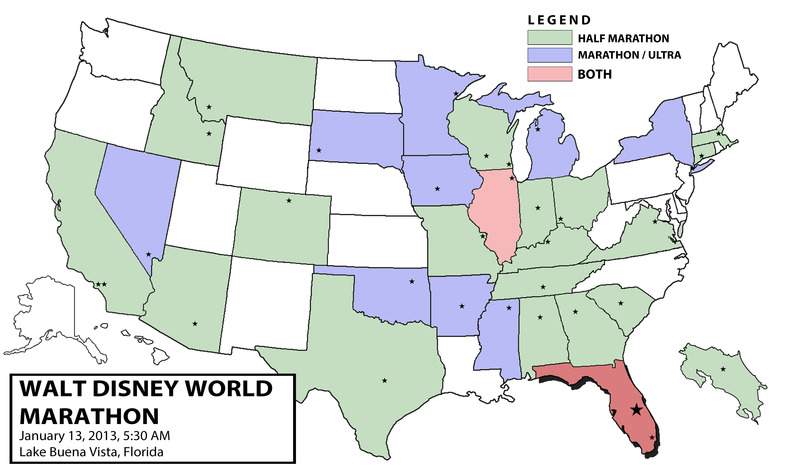 I keep hoping they’ll stage a West Coast version of their marathon, though with only 2 parks it’d be a bit more challenging. But if anyone could do it, and do it with flair, it’s Disney. No need to sugarcoat it, the post was definitely reverential, borderline panegyrical. I can’t help it — I love the parks, the characters and and the lengths that the company goes to make you feel like you’re in a fantasy world. Other companies try to mimic the greatness (Six Flags, Universal) but their efforts come off feeling like a generic knockoff. 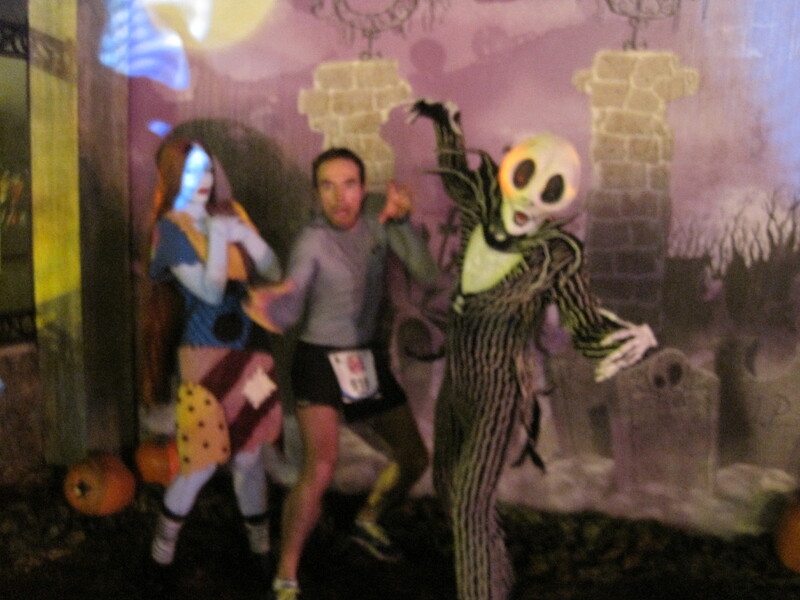 We got “Gangnam Style” just before starting The Twilight Zone Tower of Terror 10 miler in September. Every time I hear that song, I’m transported right back to the starting line! 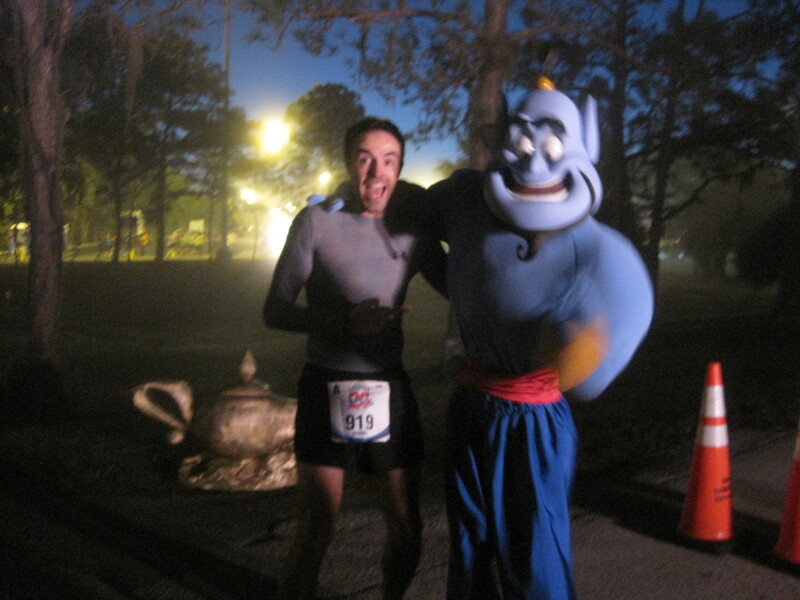 I ran the Disney Marathon way back in 2001 and do not remember a lot of it. Thanks for the flashbacks (especially the finish – I think it’s the same)! I ran the Houston Marathon the same day as this and with rainy, windy, cold conditions, it was certainly a challenge! Happy to report that the cold worked for me and I got a PR and BQ. Maybe I’ll run Disney again, your description of the pixie dust is magical!!!! The biggest reason I started this page was so that I could relive each race later in life. While I hope I remember this race in 2025, at least I’ll be able to read up on this should my memory have failed me by then. I read your Houston report — glad all went (somewhat unexpectedly) well! Thanks for reading, Jeff. But I think Disney will have to mount a Frontierland 100k to get you to sign up. Maybe one day the Mouse will venture into the ultra community and invite the Run Factory to scorch the trail. My little sister threw a temper tantrum on Main Street during a parade when she was younger. I’m not sure which of your possible explanations might have caused it, but I have never seen my parents more mortified. 20 years later, I still like to remind her that she was one of “those” kids. I don’t think Disney could ever do wrong in my book, but I’m excited to hear that the marathon is organized so well. Glad you had fun AND made it through without any issues! It’s organized painstakingly well. To the point that if you’re a veteran and you try to cut corners, they will stop you and make sure you do everything their way. This isn’t necessarily bad, but it can get on your nerves when you have to show two hours before the race start because they have every single movement perfectly orchestrated down to the minute. But honestly, I’ll put up with that for this race. Anywhere else and the post-race review wouldn’t have been as glowing. Well done! Sounds like a great time. 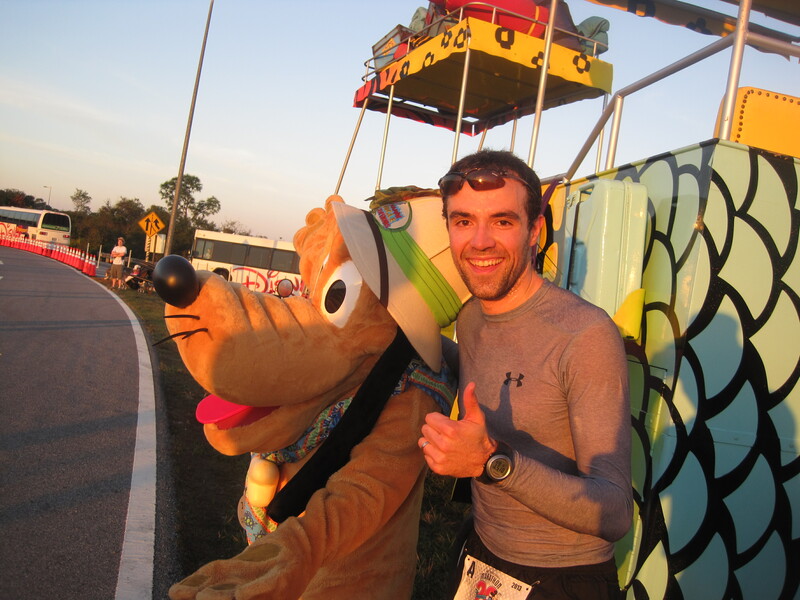 I’d never really thought of Disney as one of my “bucket list” races, but after your recap, I might have to reconsider. Devil horns + Mickey Ears = too many head protrusions or not enough? Make it happen! You need to flash some devil horns at your next race so we can add you to the blog and send you some swag. I’m a relatively new reader of your blog, but I managed to spot you coming out of the Wide World of Sports, as I was headed in. By the time I figured out that it was you, you were long gone. 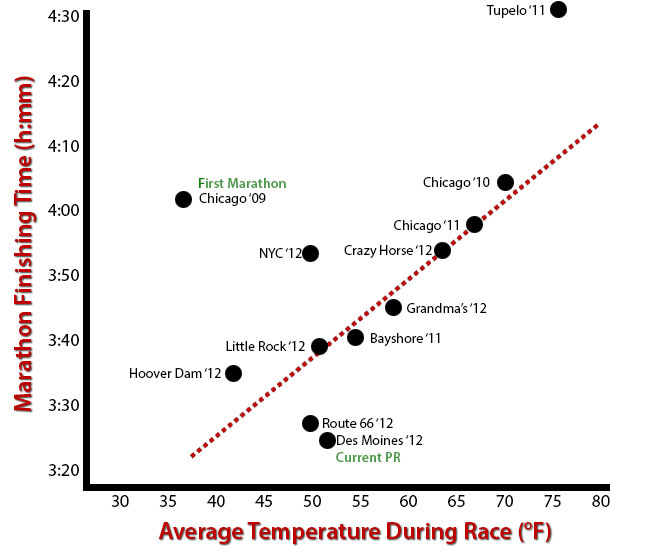 Congrats on getting such an impressive finish time on a course that is known for crowding, in a year that’s especially hot! Congratulations on the WDW Marathon! It’s on my bucket list…maybe 2015. 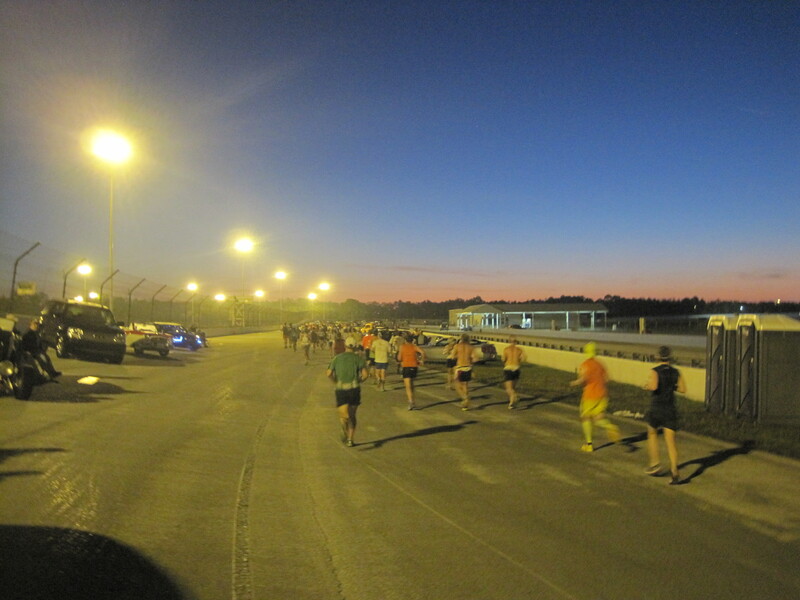 I ran the Inaugural TOT 10 miler there in September. Had a blast, but the 10pm start time was a little tough. The marathon has to be 4x the fun. I noticed NC isn’t shaded on your map. We have many great marathons & halfs: Tobacco Road, Roanoke Canal, Medoc (if you like trail running), Battleship, OBX & Asheville just to name a few. I’m sure you’ve researched but want to throw a few names out there, jic. The recommendations are much appreciated, but I’m headed to Charlotte, NC in late March for the NC Half Marathon with some friends. I’m pretty excited to get back to the half circuit, so that should be fun. And if you’re doing Disney in 2015, go for the Goofy Challenge, as it’ll be the 10th anniversary (again, not sure why I care about these things, but either way, there it is). Thanks for the encouragement Laszlo and for reading — I hope you too have a great 2013 and overcome all challenges, both on and off the racing circuit! Dan! Looks like you had a blast running this race. Is this the first time you’ve posted this many mid-race pics in an entry? That’s probably what makes this feat most impressive – a Corral A guy having so much fun and still posting the 4th best time of his life. Well done. I’ve never been a big Disney fan,bu you almost have me convinced to sign up for this next year. Congrats again on another great race! It’s not the first time I’ve taken pictures mid-race, as I had my camera phone with me while I ran the Idaho / Montana half marathons. But I don’t know why, I feel like those didn’t really “count” as much as this one did. While I certainly won’t make a habit of it, I enjoyed being able to document the details along the way. When I was little, I was too scared to go on Space Mountain. Thank you for avenging me. 2010 Disneyland forever. Congrats on an awesome marathon! I enjoyed the recap. 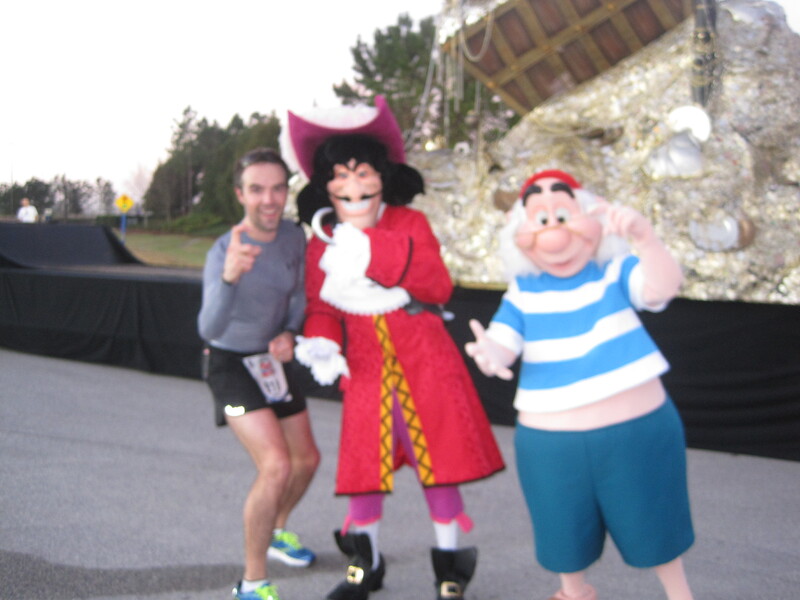 I love Disney races and all the character pictures you can get along the way. Also, I had similar thoughts on children crying at Disney! Came across blog today. Saving $ for 2015 marathon. Done lots of half marathon but this would be my first full. You definately inspired me to take the Doppy Challenge.